When and how did you start working with ceramics? I started pottery in April 2015, at a time when I needed to create a space for myself, as a stay-at-home mum with two little girls under the age of 5. I began practising as an architect in 2005, and registered with the Victorian board of architects in 2007. I worked till my first child was born in 2011. Throughout my architecture career, I noticed I needed to work with my hands. I enjoyed most aspects of the profession, but noticed I needed an outlet. Maybe because the architecture process is so long, I wanted to see results fast. I dabbled in painting, sewing, resin jewellery-making and silversmithing. I collected a lot of pieces of pottery along the years, and always wanted to learn the craft. It wasn't until I went on maternity leave from architecture that I started to look into it. After my first class, I was hooked. I go to a place called Sajo Ceramics in Kilsyth South, Victoria. It is tucked away under the foothills of the Dandenong ranges and surrounded by paddocks with horses. I find just driving there very calming in itself, and the meditation continues at the pottery wheel. Everyone there is very generous with their knowledge and experience, and my teacher Kevin Somerfield is amazing. I still go to class once a week to throw with like-minded people and to pester Kevin with questions. I love the busy vibe. It is a nice change from working by yourself. What about pottery attracted you? It is like learning a new language: how to center the clay, how to lift, where to position your hands, how to control the clay when it is responding to the centrifugal forces of the wheel. I love seeing the different stages of clay; something from the earth being shaped by hands into a solid form. Architecture and pottery are similar in that you are essentially sculpting space and considering aesthetics. In ceramics, I consider the spatial qualities of the piece and how the user feels when he or she uses it. I am drawn towards simple forms, free of decoration. I specialise in residential architecture projects, which can take anywhere from 1.5 years to three years. Sometimes, things do not come into fruition due to, for example, clients' changes of plans. In ceramics, I can see something finished in usually three weeks. "My pieces are usually simple forms with satin glazes to accentuate the form. I also like to use a clear glaze with a particular type of clay to bring out its natural characteristics." I work during the day from my home studio, around my daughters' schedules, so it tends to be very fluid. I try to squeeze in a few hours when my youngest is down for a nap in the afternoon. However, Thursday is a full work day, as both my girls are in childcare. I love what that day presents. It means no interruptions and I can be in the zone for at least seven hours. When I am throwing for a customer, I have to plan ahead. Usually my customers pick from my selection of pieces on Facebook, so I have those examples to reference from. I have to decide on size and shape, and weigh the clay before I start throwing. Even when I'm not throwing for a customer, I like to at least have an idea of what I like to create. For example, I need 1kg of clay for a dinner plate or a big bowl, but only 300g for a cup or a small vase. I like to have a rough idea before I start, but freestyle it when I'm on the wheel. Most importantly, I have to be in the mood. If I'm agitated or impatient, nothing good can come from my wheel. What methods have you experimented with? I am mainly working on the potter's wheel. I would like to take up hand building and coiling (good for making larger pieces) later. I have experimented with a few different types of clay. Each clay reacts differently to glazes. Then, there are hand-dipped glazes and brush-on glazes. I have learnt that the latter is unpredictable, but, when done right, can produce a lovely organic feel. I am working on making up my own batch of glazes. I love to showcase the natural qualities of the clay and don't want to drown it out with too much colour. My palette is rather neutral, although I would like to expand it to pastels in the near future. At the moment, I am experimenting with porcelain. It is more difficult to throw, compared to other types of clay, as it is easily distressed with too much water and there is no time for fussing around. It really pushes you to hone your technique. How did the name Bisuketto Studio come about? I started my brand Bisuketto Studio in November 2015. I timed its opening with my first market stall, to give myself a deadline and push myself to create a series. I wanted to create pieces consistent with one another, while unique. Bisuketto, pronounced "bis(u)-ket-to", is Japanese for 'biscuit'. 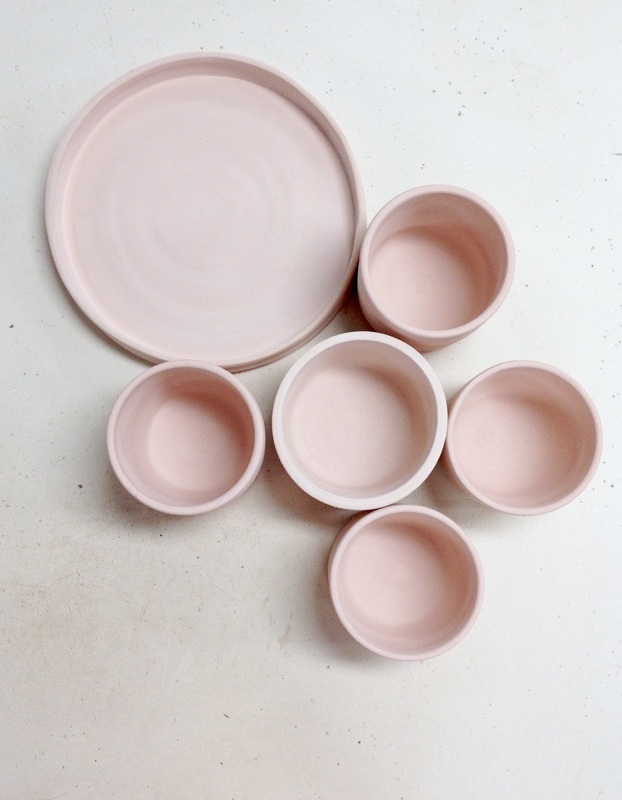 In pottery, there is a first firing, called biscuit firing or bisque firing: a piece is dried in the kiln at 1000°C, to enable it to absorb glaze later. Biscuit firing causes the piece to undergo permanent chemical and physical changes. I love this stage of pottery, the first transformation. I love this nakedness, before a piece gets dressed in glaze. After the piece is glazed, it is fired at around 1280°C (depending on the glaze you choose) and then fully vitrified. As much as I love seeing my pieces after its final firing, I love the magic of seeing my piece when it comes out from biscuit firing. It's like I'm meeting it for the first time. You can feel then if the piece will be a success or not. "Nothing is better than drinking coffee out of a cup you made." What are your future plans for Bisuketto Studio? To showcase my pieces at design markets, look for stockists, create an Etsy store and grow my Facebook page (https://www.facebook.com/bisukettostudio/). I would love to be commissioned by a restauranteur, mount an exhibition and have a bigger studio. Charmian Ong is a Singaporean-Australian architect-turned-potter.